Two days before Valentine’s Day and there is excitement all around. Hearts, flowers, romance, and special date plans are everywhere. My own personal plans are for…you guessed it…a special bottle of Chardonnay, and a Blind Date with a Book. The idea of a blind date with a book literally appeared before my eyes unexpectedly after lunch with an author friend of mine. Janet Lee Berg and I had just met. We shared a relaxing and amiable lunch at a local eatery chatting and carrying on like old friends. After our lunch, we went around the corner to select a bakery treat for her husband as a surprise. 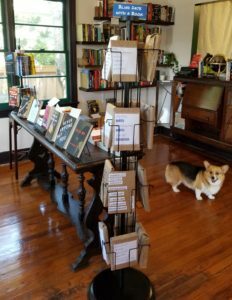 A loaf of bread was purchased, and I suggested we walk another few steps to investigate the newly opened independent book store Itinerate Literate. Again, we felt immediately comfortable in our surroundings and with the owners-who would later hostess the first event on my Book Tour for Two Minus One: A Memoir. While browsing the shop and chatting with the Christen and Laura, I was intrigued by their Blind Date with a Book display. I asked if I could take pictures and use in a post that I hoped to write later. I suggested that for a real “date” experience, they might add the option of gift cards to area eateries and/or wine shops. They agreed that might be a great idea and worth looking into. So here I am. It is now Valentine’s Day and my blind date with a book is about to be revealed. The wine is chilled, the fire is ready, Lucy has been walked and I will tear off the cover and relax with a good book. It feels like the perfect evening. There is no stress, no traffic, and little expense. Indeed, I am filled with as much anticipation as a child at Christmas. The excitement made me think of an idea that I would like to share with all of you. Two Minus One has been out three months now. I remain giddy with the letters, emails, and reviews I am receiving in support of my story. I am touched and honored that it has provided insight, peace, and hope to so many of you and to those you know. So if you are willing, let’s turn Two Minus One into a blind date with a book. 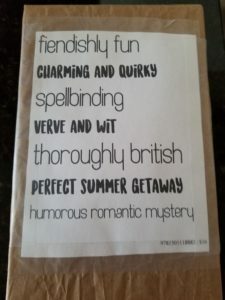 Wrap it up in brown paper -or not if you require fewer visuals than I- and write your own descriptive words that would entice unknowing readers to select it from a Blind Date with a Book display and want to take the chance to purchase and read an unknown book. Remember, this is more like poetry – brief, concise, descriptive words! Positive input, but a bit mysterious and challenging. We want our “dates” to have to work to earn our trust and respect! Give it a try and let me know what you’ve created. The responses will appear on the website and it will be fun to share!